If you love castles, then you’ll want to head over to Portugal. A major attraction for tourists and day-trippers from Lisbon, the town of Sintra is known for its variety of castles and palaces. Visiting each castle is easy too, which is one of the reasons why they are such a popular attraction. Because the town is so small, you’ll easily be able to explore it just by walking around, with an exception of some castles on the hill. Plan at least a full day in town, instead of making it a quick afternoon. I’d even suggest staying overnight, as I left with a feeling that I wish I had more time. All castles in Sintra, Portugal are stunning! 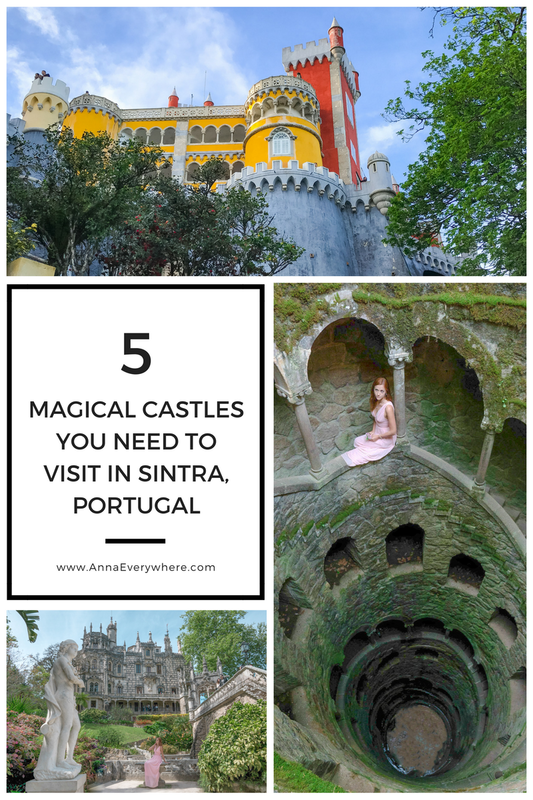 Sintra is extremely easy to get to from Lisbon, as it’s just 33 km away. 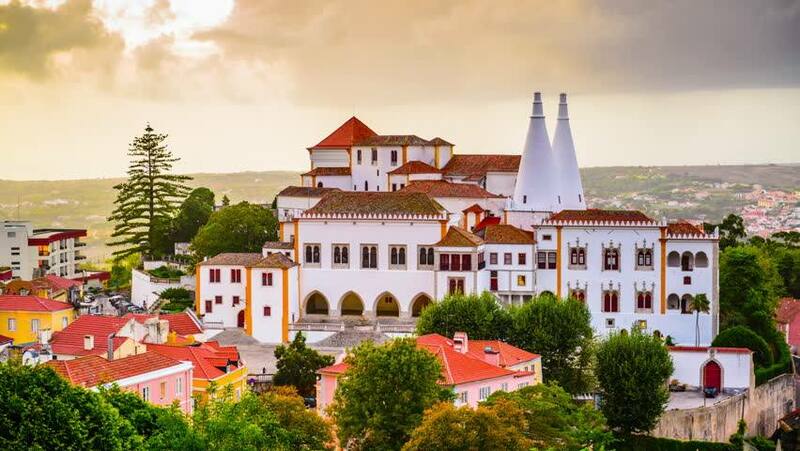 Head to the main train station and buy tickets to station Sintra. The train leaves every hour and takes about 40 minutes. Known its Romantic architecture that led to its classification as a UNESCO World Heritage Site, the town of Sintra is extremely cute and photogenic. I saw a lot of local artists selling their crafts so adorable, that even my husband wanted to buy some products. 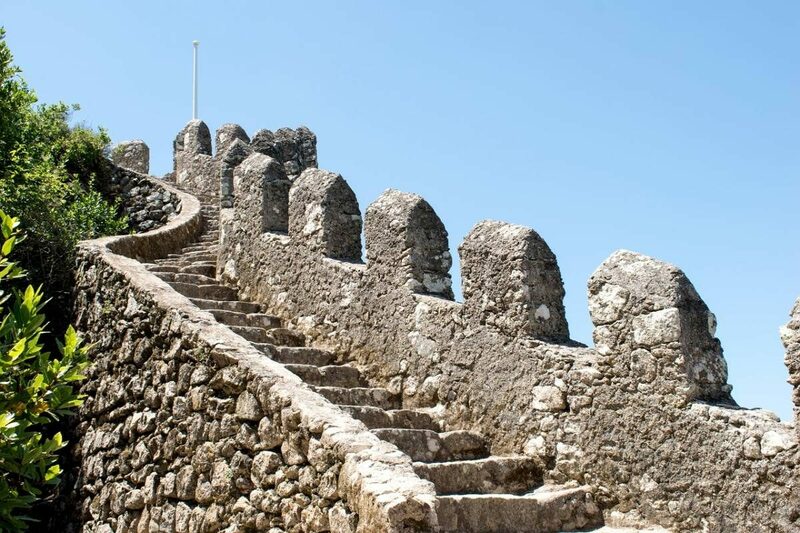 Moors Castle is noted as the least visited castle in Sintra, but it’s actually the first. Constructed between the 8th and 9th centuries by Moors, these days it’s actually located in the gardens of the Pena Palace and is looked at more as a set of ruins than anything else. This castle is mostly gray and made up of fortified stone which helps it to differ from other nearby attractions. 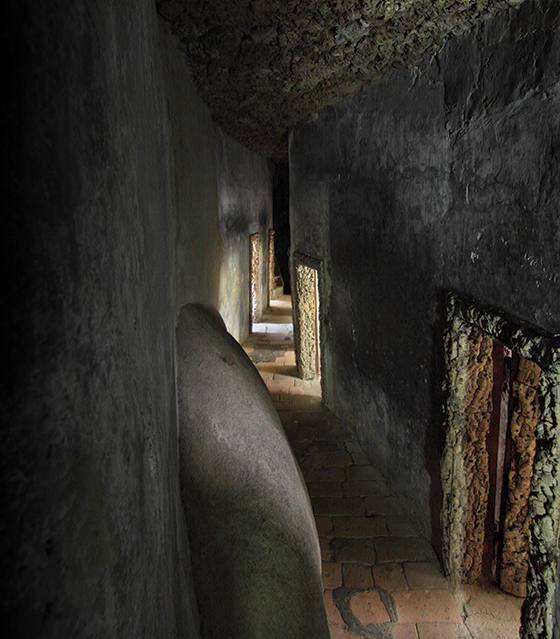 If you want, you can freely walk the grounds, including the walkways that venture up toward the top of the ruins. Moors is surely a reminder of the ancient battles and glory of former emperors. 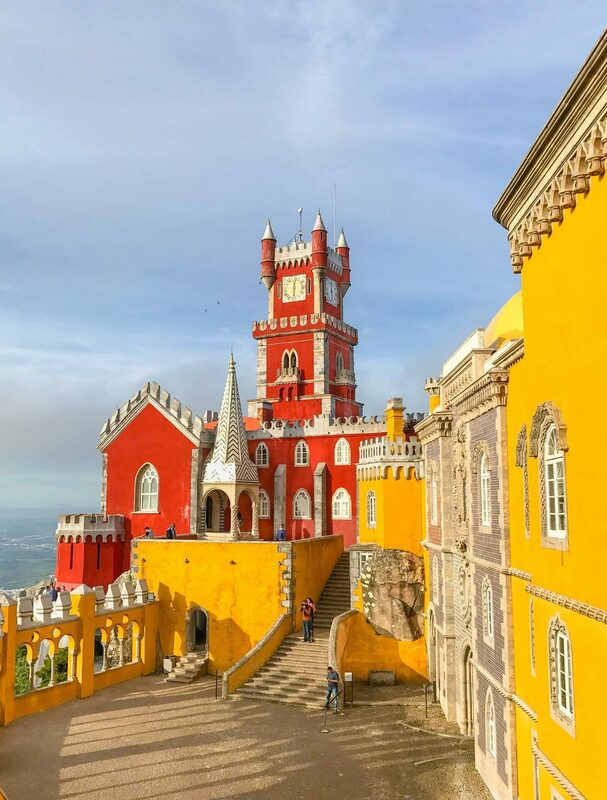 If you do choose to walk up to the top, you’ll be rewarded with panoramic views of the colorful Pena Palace, Serra De Sintra and the plains that stretch out toward the Atlantic Ocean. The most known and instagrammed of all the castles in Sintra is Palace de Pena, called ‘the Queen’s Fart’ by locals. Commissioned by King Ferdinande II, known for his strange taste, it’s a brightly colored palace surrounded by natural greenery. It looks like straight up from a Disney movie! Bright yellows and reds decorate the building walls alongside statues, battlements and painted terraces. The place is windy and when I visited it in the afternoon it was cold. Don’t forget a sweater. Inside you’ll find décor that represents the 1910s. Some of the rooms have been restored while others still house original pieces. Overall, I’d say that the rooms are surprisingly pretty small. If you’re interested in doing a little bit of light hiking, you’ll find plenty of hiking trails that surround the palace in Pena Park that spreads over 200 hectares. You can even rent some horses during the day. 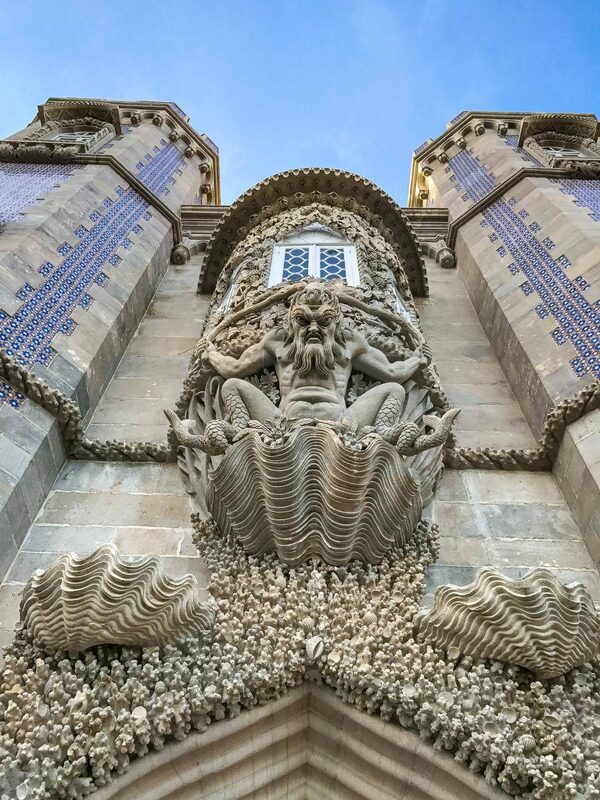 Pena Palace is open Tuesday to Sunday, from 10:00am to 7:00pm during the summer and 10:00am to 5:00pm in the winter. The entrance fee to the palace and Pena Park is 14 Euros, or 7 Euros just for the gardens. Both Pena and Moorish castles are located up on the hill that might look innocent, but it’s not. Unless you REALLY like hiking and have time to walk all the way up, spare a few Euros and get a tuk tuk. I paid only 5 Euros for it. 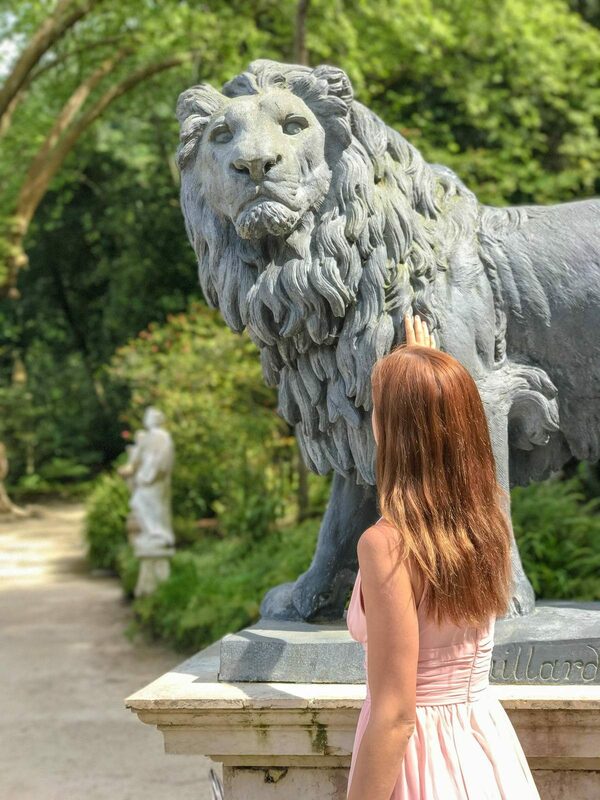 Noted as the best preserved medieval palace in Portugal, the Palacio Nacional is a great visit for those interested in where Portugal’s nobility lived the longest. The outside may not be as impressive, but the two soaring chimneys poke high above the surrounding buildings, making the building impossible to miss. The rooms inside aim to please. You’ll find walls covered top to bottom with beautiful scenes made up of glazed tile. Even the ceilings are decorated this way, with each and every one differing from the next. Because of this, you could easily spend hours viewing the inside of the palace. The inside includes a majestic kitchen with a massive wood stove. The octagonal Sala dos Cisnes (Swan room) stayed the same and includes frescos of gold-collared swans. The Sala das Pegas (Magpies Room) has a ceiling lined with images of magpies, supposedly commissioned by King João I after he was caught kissing one his Queen’s ladies-in-waiting. 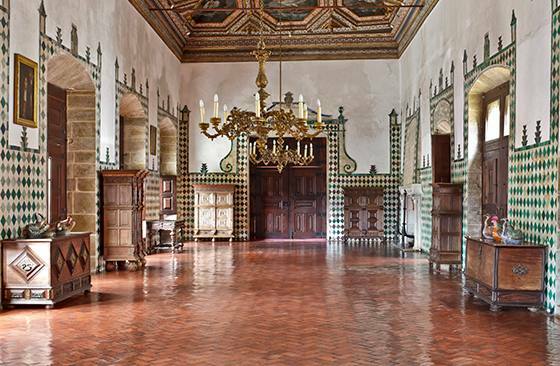 The Palacio Nacional de Sintra is open every day from 9:30am until 7:00pm. The entrance fee is 10 euros for adults (18 – 64 yrs) and 8,50 euros for youths (6-17 yrs). Designed by Italian Luigi Manini, creator of the famous La Scala, it’s a true princess’ paradise full of lakes, gardens, secret wells and fake doors. The owner also built the first aquarium in Portugal in its corner. At first glance, you’ll note the gothic façade, the greenery surrounding the building and the carved gargoyles. 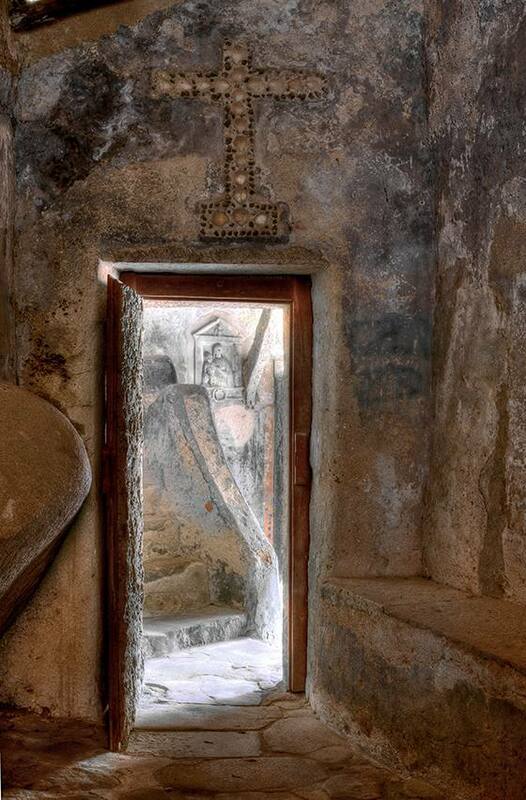 When walking around you’ll also note that almost every single inch of the outside is decorated. A little harder to notice are the references to the Knights Templar, the Masons and dark alchemy. There’s also a well that conceals a passage that not only drops down 27 meters but opens up to connect to a series of underground tunnels. 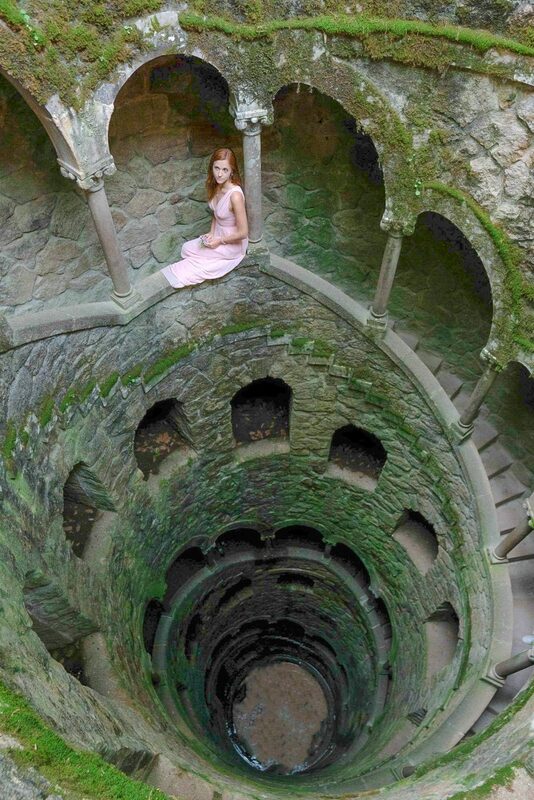 There’s also a well, known as the Initiation Well, that conceals a passage that not only drops down 27 meters but opens up to connect to a series of underground tunnels. The well is divided in nine platforms reminiscent of the Divine Comedy by Dante and the nine circles of Hell. 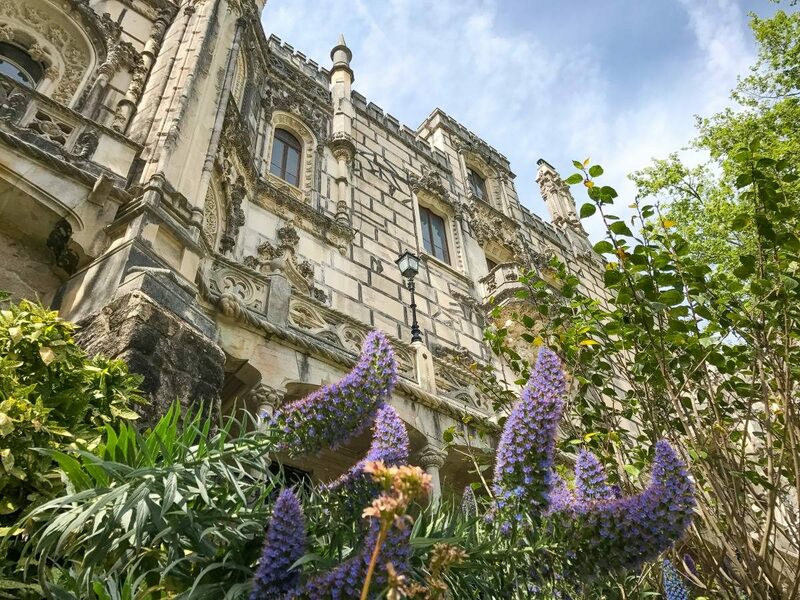 A ticket to Quinta da Regaleira costs just 6 Euros. Built back in 1789, this estate is surrounded by a botanical garden that thrives with plant species found around the world. 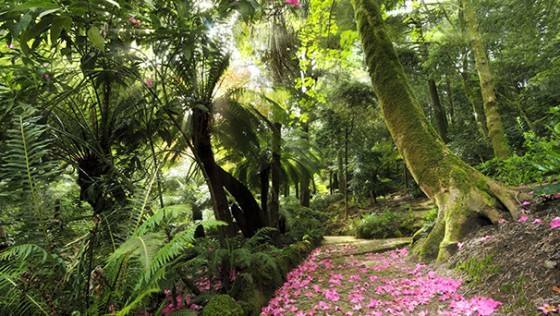 In fact, the front garden is often referred to as one of the prettiest romantic landscapes in all of Portugal. 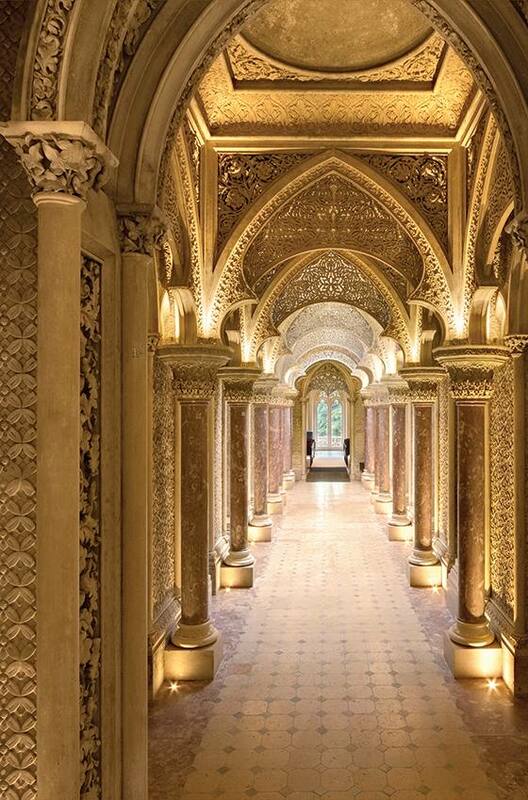 Though more of a mansion than a castle, here you’ll find Arabic, gothic and Indian structural styles all integrated into one building. You can choose to explore the property yourself or take part in a grounds tour. These tours generally last about an hour or two. Not a castle, but definitely a place worth your time. A Franciscan convent built in direct contact with nature and in keeping with a philosophy of extreme architectural and decorative simplicity. Its rustic and mystique appearance doesn’t bring many visitors, which means you’d be able to discover this place in peace. 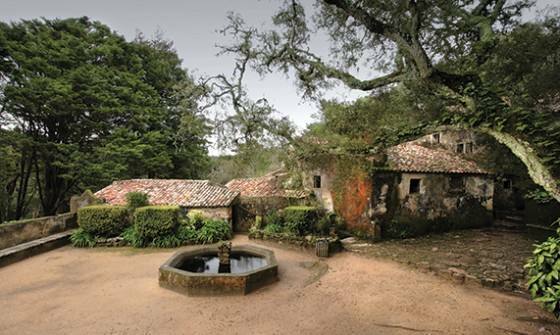 Portugal is known for its good weather all year round, so weather isn’t your biggest concern. But you’ll want to really plan your visit in advance and be careful about major holidays. If you visit during Easter, Christmas, or May long-weekend or any other weekend or holiday season, you’ll have a hard time taking a picture that doesn’t feature a few dozen people in it. In fact, the best time to visit is during a weekday in the evening after most of the visitors have started driving home. Guesthouses and hotels in Sintra don’t disappoint. I’m not subjective about it since most reviewers gave these properties over 8.5 (out of 10) rating. The Biester Charm House – Truly magic spot and totally reasonably priced. Just look at the photos and you’ll know what I’m talking about. La Galette – If you like rustic decor with high-standard accommodation, this is your place. These castle look incredible! I wish we had more building like this today. Great post with beautiful images. I especially like the pic with you sitting on the edge of the well. Lovely pics! 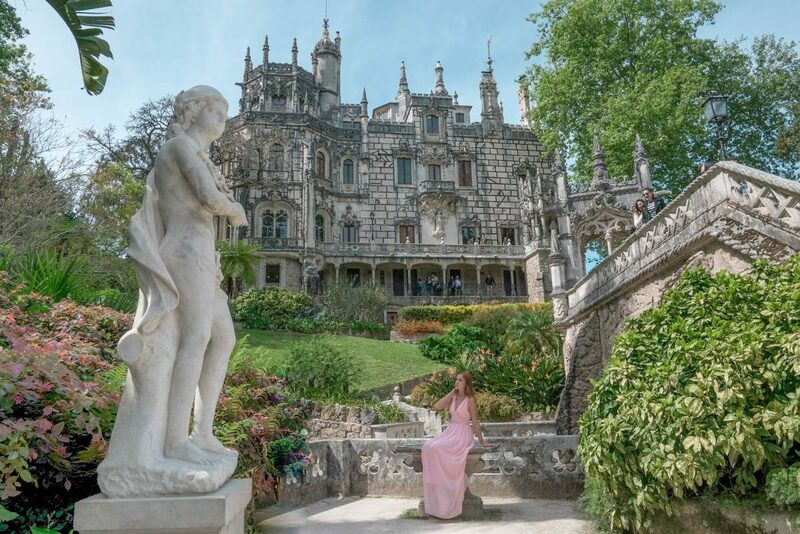 I fell in love with Quinta da Regaleira a little bit when we visited. Definitely a princess moment!! Hi Anna, Thanks for the tips and the beautiful pics. My husband and I plan to visit Sintra on Easter Sunday (unfortunately we will have to deal with it being super busy). We would like to visit the Moorish Castle, Pena Palace and Quinta da Regaleira. Do you know if all 3 of the castles will be opened on Easter Sunday? Thanks! Hi Anna, thank you so much for your insight on the castles! 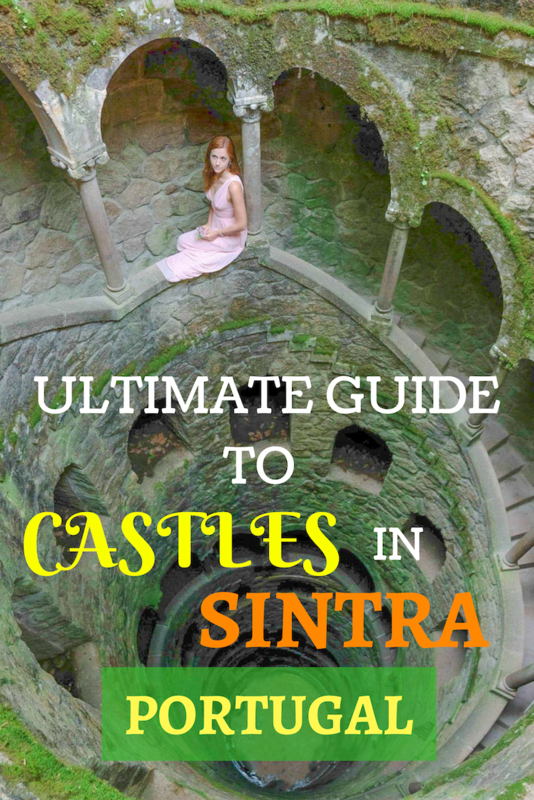 Your notes are very helpful 🙂 I have a question for you – I will be spending a full day in Sintra, how many castles do you think would be do-able in 1 day and which ones would you recommend? How much time do you want to spend at each? Since I’m a photographer I managed to do two in a day, but I think 3 are manageable. Hi Anna-loved all your pics and ofcourse the detail infos. from Pena Palace how can we go to the others? is there tuk tuk or taxi available near Pena Palace? Hi, yes, there were many taxis and tuk tuks next to Pena Palace when I visited. We also flagged one to get up to Pena Palace, as it’s quite a walk uphill (you might want to get one with your daughter). Thank you Anna. We are little concerned since our little one is going to travel with us. So after Pena Palace is it possible to grab a tuk tuk or taxi form Pena palace to Monserrate Palace? And again Tuk Tuk/ Taxi from Monserrate to Quinta da Regaleira? You can take a train to Sintra and then taxis or tuk tuks between castles. Yes, every spot has an entrance fee (eg. Pena – 14 Euros, La Quinta 6 Euros). You can definitely walk from the train station to La Quinta, but Pena Palace, for instance, is a big hill.